February’s total new vehicle sales saw a negligible year-on-year decline of 0.1%, with sales of 48 113 units. 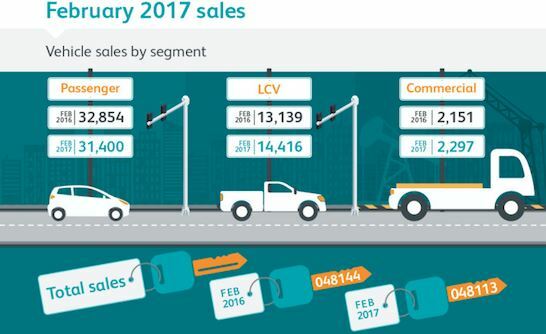 According to the latest aggregated sales data from the Naamsa sales growth was seen in a number of segments, including light commercial vehicles (9.7%), medium commercial vehicles (8.5%) and heavy commercial vehicles (27%). WesBank’s internal data reflects the trends seen in the consumer space. February saw demand for new vehicles drop 8.4%, year-on-year. Demand for used vehicles also slowed, with 5.3% fewer applications received compared to February last year. Consumers who did finance vehicles also paid more: the average deal value for a new car was 8.8% higher, while the average car was 9% more expensive year-on-year.